To assist and promote women in the professions of food, wine and hospitality, the Cleveland chapter of Les Dames d'Escoffier is offering a $2,000 culinary scholarship.This will be awarded to a woman student enrolled in an accredited culinary program for the 2019–2020 academic year, who has permanent Ohio residency. This scholarship is awarded based on academic accomplishments, career goals, culinary experience, professional and personal references and financial need. Awarded scholarship money will go directly to the school or institution in which the recipient is enrolled and must be used for tuition only. Non-profit organizations (501c3) in Northeastern Ohio that are in concert with the philanthropic mission of the Cleveland Chapter of Les Dames d’Escoffier are encouraged to apply for a one year grant of up to $2,000. Grant applications will be accepted from February 01, 2019 to April 01, 2019. The grant winner will be announced by June 01, 2019 and the monies will be awarded by June 15, 2019. Chapters around the country including Cleveland are participating in civic agriculture and garden projects, collaborating with established programs in their own communities or starting new ones. LDEI/Cleveland is interested in supporting organizations that strive to help individuals of all ages in Northeast Ohio better understand the link between farming and the food on their plates. This grant opportunity will not pay for consultants, organization overhead, office equipment, or travel expenses. No grants will be awarded to any organization that employs a member of LDEI/Cleveland. See past grant recipients below. Les Dames d’Escoffier (LDEI) launched a nationwide initiative called Green Tables in 2006 to help people better understand the link between rural and urban farms and their tables. Many Dames are at the forefront of this global movement to transform how we eat. Chapters around the country including Cleveland are participating in this civic agriculture and garden project, collaborating with and starting programs in their own communities. 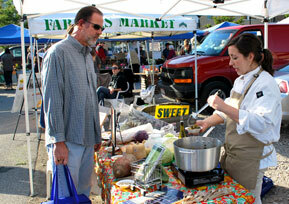 Farm-to-market leaders fostering links among regional farmers and local restaurateurs, caterers, etc. Connect on Pinterest to see what various chapters are doing with Food Day and Green Tables. 2014-2015 Green Tables Initiative Grant! Take Charge and Learn Food was awarded the grant to educate and connect residents of East Cleveland and surrounding communities about the benefits of fresh locally produced fruits and vegetables available at the Coit Road Farmers' Market. The need was addressed through two monthly events, free to participants, over a one year period. Take Charge targets individuals who want to improve their overall health, but have limited resources. Learn Food targets food oriented individuals from the Cleveland area who want to improve their cooking skills using fresh local ingredients. 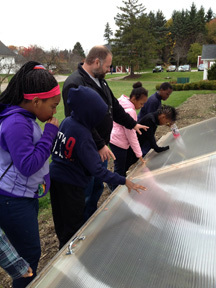 The CWRU Farm was awarded $2,000 to expand its year-round food production capabilities. This expansion benefitted school visitation programs between staff at University Farm, faculty and students at the Francis Payne Bolton School of Nursing at Case Western Reserve University and 5th and 6th students at the Michael R. White Elementary School in the Cleveland Municipal School District. 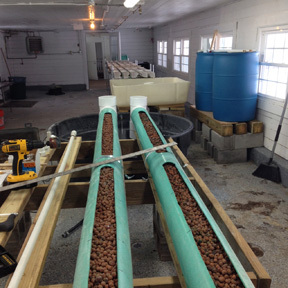 Funds were used to upgrade the existing hydroponic system and to construct cold frames. 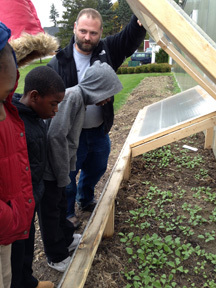 The addition of these two improvements allows for increased understanding and enhancement by the students regarding the local food system, as they are now able to participate in food cultivation no matter what time of year they are able to visit for their field trips. The academic year is mostly out of sync with the food production season as it relates to the traditional growing season in our climate. Increasing University Farm's year-round food production capabilities allows for better accommodation of both the public school's availability as well as that of the nursing students. 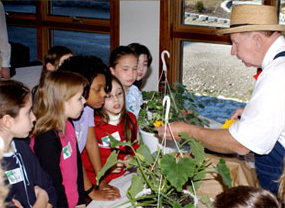 In 2010, the chapter awarded a $2000 grant to Veggie U to help place new Earth to Table kits and provide teacher training for fourth grade classrooms in Cleveland area schools. 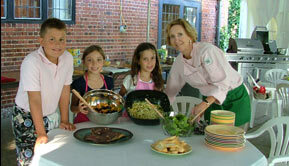 In 2008, the chapter also contributed to the Countryside Conservancy Farmers' Market Jr. Chef Program. The focus was on forging connections between kids, farmers and food producers; teaching nutritional fundamentals; and simple hands-on food preparation. 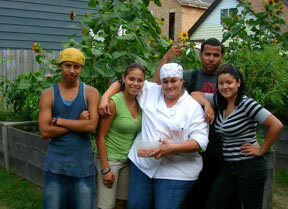 The Cleveland chapter provided financial support to the Tremont Urban Learning Garden, a food-growing project for at-risk city teens, in 2007 and 2008. Today, the mini-farm still offers an opportunity to build agricultural and entrepreneurial skills as well as nutritional awareness. A portion of the organic produce the teens harvested was donated to CityFresh Market, which offers fresh, local sustainably raised fruits and vegetables to low-income urban residents. The balance was purchased by Lucky's Cafe, a restaurant adjacent to the garden and owned by Dame Heather Haviland, who still plays an instrumental role in the project.